Monday from 5.30pm | Tundeworld! Relax with Qigong exercise after the busy day. This class is open to all ages and levels of experience. Even though it is called a beginners class, in Qigong there are not really any levels but there is a level of depth you will experience.... the more you do the practice the more you become aware of its profound health benefits and you will also notice a shift in your healing abilities and intuitive awareness. Refresh your mind, relax your body & reawaken your soul. Start your morning off with a leading Qigong session. Many people find that Qigong boosts their energy, stamina, and agility, sharpens their reflexes, and gives an overall sense of well-being. Tai chi has both physical and mental benefits. What is happening during out training? The training build up with three generally systems. Usually mixed the Tai chi and Qiqong movement focus for group body problems. 1. nice warm up "exercise"
3. coal down with meditation, and do Qigong movement. 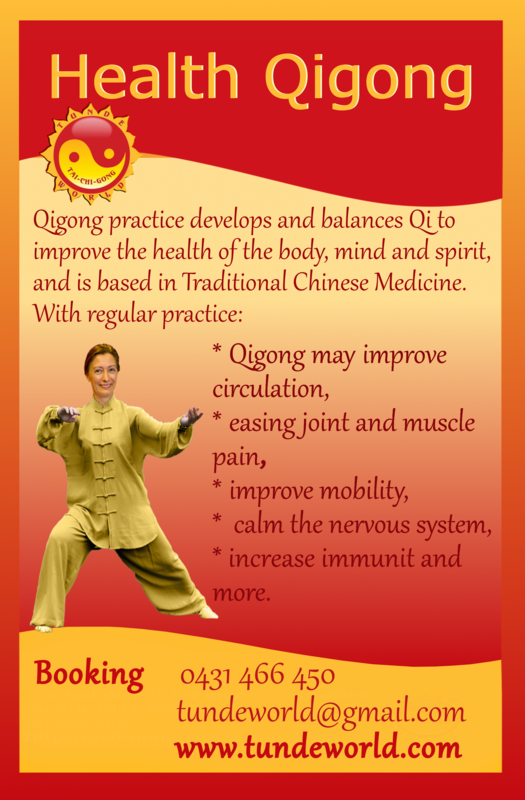 Come and enjoy the group QiGong experience for the powerful healing effects and also the social contact. All new people are very welcome to join the group. Print off this Form , complete it and take it with you at the first time when you come to the class. Please help me with your booking as I need to prepare our place inside or outside for the correct number of people attending here click for.